Sure, you know leafy green things like kale, chard, beet tops, mustard greens, and collards are the definition of Good For You, but what do you do with them? I’m not a fan of the “throw in a pot with bacon and water, cook for hours, and hope for the best” approach. I know there is probably some elderly but still elegant lady in the south who wears pearls, smokes cigars, and makes a mean mint julep that can slow-braise greens with some secret recipe that makes them taste yummy. But she doesn’t live in my house. 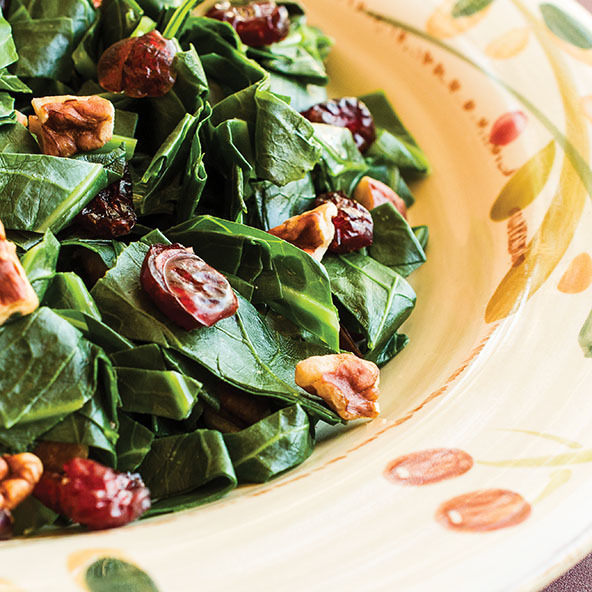 There are two recipes below to turn piles of greens into delicious edibles, but if you really want to keep it as simple as possible, toss washed and chopped greens into a skillet over medium-high heat. Add 1-2 tablespoons water, bring to a boil, cover and simmer ‘til the leaves are tender. Remove the lid and let the extra water evaporate. Turn off the heat, drizzle the leaves with olive oil, then stir in salt, black pepper, and a crushed garlic clove. Sprinkle a squeeze of fresh lemon juice. Done! Wash the greens. Remove the tough ribs, then stack the leaves and cut into 1/2-inch pieces. Heat a large, non-stick skillet over medium-high heat. Toss the still-wet-from-the-washing greens into the pan, add 1/2 cup water, cover with a lid, and steam 5 minutes or so, until almost all the water is evaporated. Remove the lid, toss the greens with two wooden spoons until they are very dark green. The leaves and the pan should be dry. This takes about 2-3 minutes. Push the greens to the side. Add coconut oil or ghee and when it’s melted, drop the minced garlic, pecans, and cranberries into the fat. Cook until fragrant, about 30 seconds. Toss everything together and allow the greens to cook another 5 minutes. Add salt and pepper to taste, then eat your vegetables! Wash the greens and remove the tough stems with the tip of a sharp knife. Roughly chop or tear the leaves. Unlike salad greens, you want to let a little water cling to tough braising greens. The water droplets turn to steam in the pan and tenderize the leaves. Heat a large skillet over medium-high heat, then toss in about half the greens. Stir them with a wooden spoon until they begin to wilt, then add the rest of the greens. Stir, then cover with a lid. In a small bowl, mix the Ras el Hanout, garlic, and salt with a fork. When the leaves are dark green and beginning to wilt, remove the lid and let any remaining water evaporate. When the pan is mostly dry, push the leaves to the side and add the coconut oil. Let the oil heat, then pour the spices directly into the pool of oil to release their fragrance (and flavor), about 20 seconds. Pour the coconut milk into the pan, stirring to combine the greens, seasonings, and milk. Sauté until the sauce begins to thicken and your nose is delighted by the aroma. I made the creamy version last night. I lost my mind, it is so good. I typically just toss in some balsamic and call it day, but this is a new high. This looks excellent! I don't fix Kale as often, as it tends to take longer to cook, but I think it might be worth the time with your recipe above. Yum! This runs more along southern lines with the bacon, but without the 'let's cook the life out of our food' attitude. I love greens! Can't wait to try these recipes out. I've also broiled Kale and it's delicious. I call it "Krispy Kale" and you basically brush washed leaves with olive oil, sprinkle with kosher salt and ground pepper and then place them on a cookie sheet and broil them until the leaves get crunchy. It almost tastes like fried spinach. My kids love it. Leeny, kale chips are on my "must try" list — I'm thinking about making them for the Superbowl. Thanks for posting! "Sauté until the sauce begins to thicken and your nose is delighted by the aroma." My nose was definitely delighted by the aroma. Fabulous! Thank you so much for sharing. I still need to do the Garlicky ones, but the creamy ones are going to be made around here often! Brandy, the creamy ones are really good, aren't they? I have a new recipe I need to post for yellow squash cooked with coconut milk — and tonight I'm trying okra. If it works, I'll definitely share. The "creamy" version is really great with green beans too! I am a bad cook. However, I used your recipe for the creamy kale and it tasted like something that someone else made… that is one of the highest compliments that I can write. GREAT flavor! Thanks. Dara, this made me laugh so hard. You’re sweet — and now you can no longer say you’re a bad cook. Hope you’re having some fun in the kitchen! I’m just starting to explore a healthier diet and bought some red chard tonight. I thinly sliced a couple shallots and a small handful of garlic cloves then through them into some olive oil. I let them cook on low for a while, giving them a stir every now and then until they were caramelized. While they were cooking, I chopped up the chard stems and leaves separately and threw the stems into the pan. When everything else was done (steak, baked apples, sauteed brocollini, salad with pears, toasted pecans, dried cranberries, balsalmic/walnut oil/dijon dressing), I threw in the leaves until they were wilted and added some salt and pepper flakes. So yummy I can’t wait to try more recipes – your creamy recipe sounds good. I love adding the chopped up stems to the leaves… well done, friend! Your dinner sounds ridiculously yummy. And yeah, the creamy greens are out of this world. I’ve made the creamy version a few times, but never with Ral el Hanout… oh man my tummy and tastebuds are so freaking happy right now! Definitely making this many times to come! I made the Creamy Spice Market Kale recipe (from my copy of Well Fed) tonight and it was the first time my five year old son has admitted to LIKING KALE. He tried two bites, and have it a thumbs up. Thank you for creating a method of cooking kale that works! Really glad it was a hit! And super glad that your 5-year-old gave it a thumbs up. Right on! Thanks for the sweet words about my site! I’m so glad you’re finding it helpful. I think combining the green should work just fine but some of them take less time to get soft, so you’ll want to add those at the end. Chard is pretty soft, more like spinach than kale, so it wilts fairly quickly. 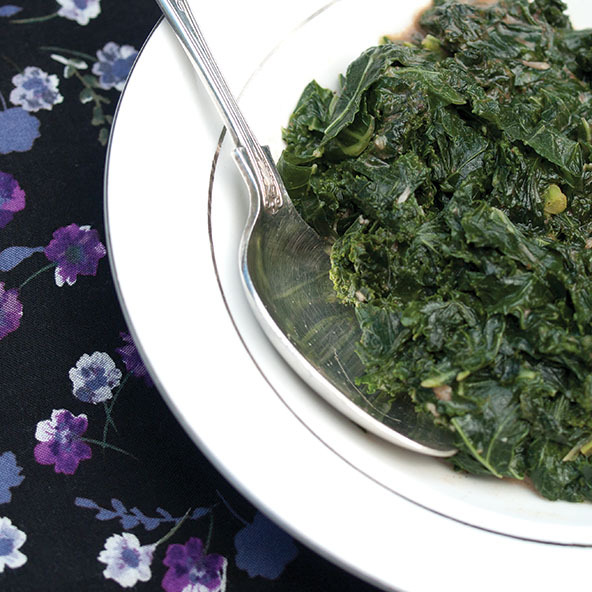 Kale and collard greens need a little bit longer to get soft. Hey Melissa! I’m kind of late to the party on this one, but I just made the creamy version of this last night!!! It was delicious, but I don’t think I let the kale cook long enough because it was still really bitter (I used lacinato kale). I loved the flavors of the coconut milk and the Ras el Hanout together and I am going to try adding some raisins next time too. Do you think I could speed things up and take some of the bitterness out of the kale by blanching it first? I do this with broccoli rabe and it works pretty well. Absolutely. Blanching first will work just fine. Enjoy! Use medium-high heat. “Wilt” means that the leaves are sturdy and stiff… as they water steams them, they literally wilt and become tender. Keep adding a little bit of water to the pan if it gets dry and cook them until you like the texture. Don’t worry! You can’t mess it up.